The Friday night session of Church of God Convention 2019 & General Assembly is slated to be something very different than the Movement has ever seen. 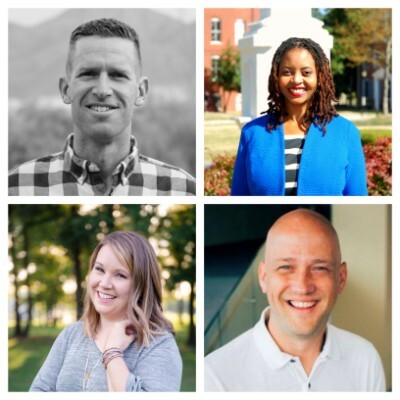 Weaved into an interactive worship experience led by Josh Edington, a TED Talk-style format will give four of the brightest and best younger ministers in the Church of God the opportunity to address the gathering in brief, but engaging conversation. Allyson Smith (Community Church of God, Atlanta, Georgia), Matt Anderson (McDowell Mountain Community Church, Scottsdale, Arizona), Erin Taylor (First Church of God, Alma, Michigan), and Jake Zaske (Indian Creek Community Church, Olathe, Kansas) are looking forward to participating in an evening designed to challenge pastors and lay leaders to breathe, speak, and give life to their churches and communities. In an interview with Church of God Ministries (CGM), each one offers an introduction of who they are and why they’re anticipating Orlando. CGM: What excites you the most about being a featured speaker in the TED Talk-style experience at Church of God Convention 2019 & General Assembly? Allyson: I love trying new things! I am excited to be a part of the new format. I love TED Talks. To utilize that style for the Church of God Convention brings me great joy. Matt: I’m honored and humbled to serve alongside some incredible communicators and worship leaders in a creative way to engage and inspire our tribe gathered in Orlando. Erin: I believe that, in ministry, we always do it best when we do it together. As we continue to collaborate and plan the Friday evening service together, I think we all sense that God has something special in store. We are praying that, throughout the whole convention, we experience renewed life and calling through Jesus. Jake: The Church of God offers us the opportunity to play a part in a larger kingdom impact. The TED Talk approach places this on display in a practical way, as I get to partner with others on that night to see God’s kingdom come. Matt, Allyson, and Erin are all phenomenal teachers and leaders. What a gift to partner with them in this! CGM: What keeps you going, day after day, week to week, in what you do for the Lord? Allyson: The driving motivation behind my ministry is the belief that we can all be healed from something. Day after day, I am reminded of the healing power of Christ’s love. I want everyone to experience this power the same way that I have. Matt: I love working to build a community following Jesus, which is learning to love everyone, always. Communicating the stories and teachings of Jesus in a fresh and engaging way—so people come to better know and follow him—is humbling to me. I love hearing stories of people in our community who have come to realize the extent of God’s love for them, his presence in their lives, and their commitment to him. Erin: One of the great prayers of my life is that God would use my life. I want to be totally poured out for him with nothing held back. There is nothing better than being part of what God is doing. Seeing Jesus change lives keeps me motivated to keep giving my all to be a part of the mission. Jake: The opportunity to join God in the larger story he is writing in the world is such a privilege. I have the opportunity to vocationally help people experience the freedom and joy that comes from knowing Christ. The idea of both individuals and entire communities being changed and transformed by the power of Christ is more than enough reason to get me out of bed in the morning. CGM: As younger pastors in the Movement, what’s one thing you’d recommend churches do intentionally to help bridge generational gaps in church life? Allyson: I believe the generational gap can become smaller when we have authentic and honest conversations rooted in love. Many things the present generation is experiencing, previous generations have experienced the same. Let’s remove the shame and have dialogue about how we have survived with Christ’s love. Matt: One of the things we’ve been intentional to do at McDowell is hire and engage leaders on both sides of the generational spectrum. For example, in the past two years, we’ve hired the founding pastor of McDowell, Don Doe, as one of our Community Life pastors, and we’ve hired a StudentLife director, Sarah Wedel, who is just starting out her ministry and vocational life. The relational culture of our team filters through the life of the church. We honor and respect one another, no matter the preferences and perspectives we bring to the table. This has helped build an intergenerational church that enjoys life together. Erin: The church is uniquely equipped to help generations connect with one another. Where else in our society can people of all ages find friendship and belonging together? We can help connect generations in simple ways, like sharing stories, serving together, and being prayer partners. For example, at the start of the school year, invite adults to commit to pray for a specific student for the year ahead (and invite students to pray for their prayer partner, too!). Jake: Multi-generational churches must have multi-generational leadership teams. People must see themselves (age/life-stage) on the stage and in the crowd. Without truly empowering and releasing emerging leaders, a church stands little chance of reaching a given generation. CGM: What are one or two unique facts about you? Allyson: I love to laugh, I love history, and I love media. I am currently in graduate school to be a media historian. I own over 700 movies and TV shows! Matt: Unique? No idea, haha! But I do love to hike/run in the Arizona sunshine. I enjoy golf. My favorite thing to do is coach my kids’ sports teams. Erin: My husband Dan and I love that adoption is at the heart of the story of our family. We have four children (age seven and under), and three of our kids are adopted. We are so grateful for the amazing kids that God has entrusted to us. We’ve experienced adoption as an incredible picture of the way that God calls us his sons and daughters. I’m honored to be among the growing number of women in our movement who are serving as senior pastors. There are so many incredibly gifted women that are part of the Church of God, and I look forward to more and more of our congregations affirming and calling these gifted leaders. Jake: God writes unique stories for all of us. My ministry story has taken me from the Midwest (outside Chicago) to England, then California, then New York City, and finally back to the Midwest (Kansas City). You might say God took my wife and I to Europe and both coasts before returning to the Midwest. I enjoy watching almost all sports and spending time with my kids as much as possible. CGM: What excites you the most about the Church of God movement today? Allyson: I am excited to watch the next generation of Church of God leaders continue the legacy of my family in the Church of God movement. Matt: I believe that, if we could better commit ourselves to unity and holiness in today’s world and cultural climate, we could have an incredible impact in our world. It would demand we do some serious work on our theology and practice, and commit ourselves to a new path forward. But, again, it could have an incredible impact in our world today. Erin: I sense that God is moving in our midst. I’m especially encouraged by the growing number of emerging leaders. I have served as a coach for Leadership Focus, our Church of God ordination coaching process. I’m inspired and hopeful as I connect with other leaders (of all ages!) who are answering God’s call. Jake: I am fairly new to this Movement of churches. Coming in with fresh eyes, I see a leadership team willing to change and evolve to meet the current needs of our communities today. We have a rich heritage built on racial reconciliation, empowering women in ministry, a passionate desire to submit to God as we pursue holy lives, a belief that God can do anything, and a spirit of empowerment. I believe the world is crying out for this sort of message that can be reclaimed. Learn more about Allyson, Matt, Erin, and Jake at www.chogconvention.org. Don’t miss Church of God Convention 2019 & General Assembly, June 27–30 at the World Center Marriott in Orlando, Florida! This entry was posted in All Church of God, Church of God Convention and tagged Allyson Felecia Smith, Allyson Smith, camp meeting, Campmeeting, CHOG Convention 2019, Church of God Convention, Convention 2019 & General Assembly, Convention 2019 and General Assembly, Erin Taylor, FL, Florida, generational gap, Jake Zaske, ministers, NAC, North American Convention, Orlando, speakers, TED talk, TED Talk Format, TED Talk-style, World Center Marriott, young ministers, young pastors, younger generation. Bookmark the permalink.